A funny thing happened on the way to implementing the brand X records management solution; somebody forgot to tell the legal department that the way they need to organize content is not the same way the business needs to organize content. The business may organize their content into a nice clean hierarchical folder structure by client and product, or maybe they group items by business process or maybe the business has no structure to their content and chooses to rely on metadata to organize content items. Most likely it’s a combination of all three. Enter stage left: records management. Suddenly the legal department needs to group content based on how long the business legally needs to keep the item rather than grouping by business process. The content items no longer fit nicely within the “Smith Acquisition – Regulatory Documents” folder. Instead they are regulatory documents for Kentucky which have different requirements for document retention than the regulatory documents for Tennessee, Indiana and Wisconsin. Unlike other solutions on the market, Oracle WebCenter Content: Records Management (formerly Universal Records Management or URM) can easily handle the situation we just described. WebCenter Content: Records Management manages content items regardless of source or format, in a single, consistent, manageable infrastructure. The content items can be electronic documents such as spreadsheets and photos or physical items such as boxes of signed documents. Most importantly, regardless of the type of content, all managed items can be assigned to a “Retention Category” or folder which is independent of how they are actually stored within the content management system. That separation allows the legal department to group content items differently than the rest of the business, which is an important feature for many organizations. The Retention Schedule represents the starting point, or highest level, of a hierarchical structure that is used to arrange content items based on the rules for retention. It is from this starting point that an organization will begin implementing a records management structure to match the legal requirements and business needs of their organization. Series: Within WebCenter Content: Records Management, Series are used to divide the Retention Schedule into logical groupings. A Series can be thought of similar to a folder in Windows Explorer; however, it cannot actually contain a content item. Instead, it contains other Series and Retention Categories (see below). 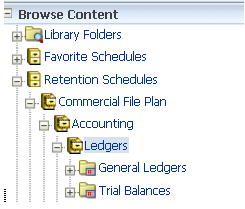 In this example, you can see a Series (Commercial File Plan) which contains another Series (Accounting) which contains a third Series (Ledgers) which finally contains the Retention Categories of General Ledgers and Trial Balances. Retention Category: In the image above, General Ledger and Trial Balances are Retention Categories. A Retention Category contains the content items that will be managed by the software. It has security settings, notification information and most importantly, disposition instructions which indicate when to take action on content items within that category. The rules that describe what to do to the content items are called Disposition Instructions and are a very important aspect of the Retention Category. Disposition Instructions will be covered in a future blog posting, but for now it’s important to notice that there can be only one set of Disposition Instructions per Retention Category. The implication of having a single set of Disposition Rules for a Retention Category is that documents with different retention periods are usually best separated into their own Retention Category. Also of interest is the fact that a Retention Category cannot contain another Retention Category. If there is a need to group documents together within a Retention Category, the Oracle WebCenter Content: Records Management software has the concept of a Records Folder. 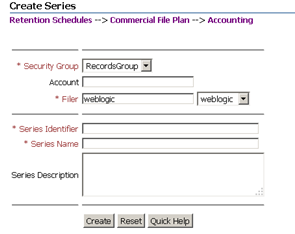 Records Folder: A Records Folder can be created within a Retention Category, but not within a Series. Each Records Folder can have a separate set of dates (activation, deletion, etc.) as well as profile triggers and other information to help manage content within that folder. However, since the Records Folder is contained within a Retention Category, it also can inherit the attributes and disposition of that Retention Category. Additionally, Records Folders can be nested within other Records Folders. 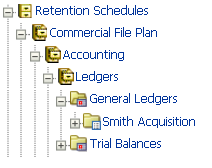 In this example, the General Ledgers Retention Category contains a Records Folder for the Smith Acquisition. Presumably, these documents need to be handled slightly differently than standard general ledger documents. Now that we know a little bit about what a Series, Retention Category and Records Folder are used for, we can start creating them to match the needs of the organization. Within WebCenter Content: Records Management creating these items is very easy. Browse to a location within the Retention Schedule where you want to create the Series, Retention Category or Records Folder, choose Create and select the appropriate item from the menu. In the example above, we are in the Series called “Accounting”. Since it’s a Series, it can only contain another Series or a Retention Category so those are the only two items listed in the drop down menu. However, as you can see below, if we are in a Retention Category we can create a Records Folder, a new Content Item or a new Physical Item. The screens used to create a Series, Retention Category and Records Folder all contain a Quick Help button which explains how each of the fields on the screen is used. More information on creating a Series, Retention Category and Records Folder along with all of the fields on the creation screens can be found in the Setup Guide for Records Management. Once an item is created, editing or deleting is easily done from the menus. Select the Action icon next to the item you want to modify and then choose the appropriate action from the menu as shown below. In summary, the combination of Series, Retention Category and Folder are the basis for all records management implementations using WebCenter Content: Records Management. They are used to create a structure that groups content items together based on legal and business rules for disposition of an item. We will explore the details behind these disposition rules in a future post. If your company needs help with any aspect of an Oracle WebCenter Content implementation, TEAM Informatics is here for you. Whether you need a subject matter expert for a few hours or an entire implementation team to run your project, we have the resources and expertise needed to make your project a success. This entry was posted on Wednesday, May 30th, 2012 at 10:54 am and is filed under Oracle, Records, WebCenter Content. You can follow any responses to this entry through the RSS 2.0 feed. You can leave a response, or trackback from your own site.